Spring and summer 2010 were spent planning and preparing for a development of our work in Gaza — a fully independent convoy, avoiding the politics which beset other organisations involved in the region. As is traditional for us, we drew together volunteers and local fundraising groups from all over the UK. 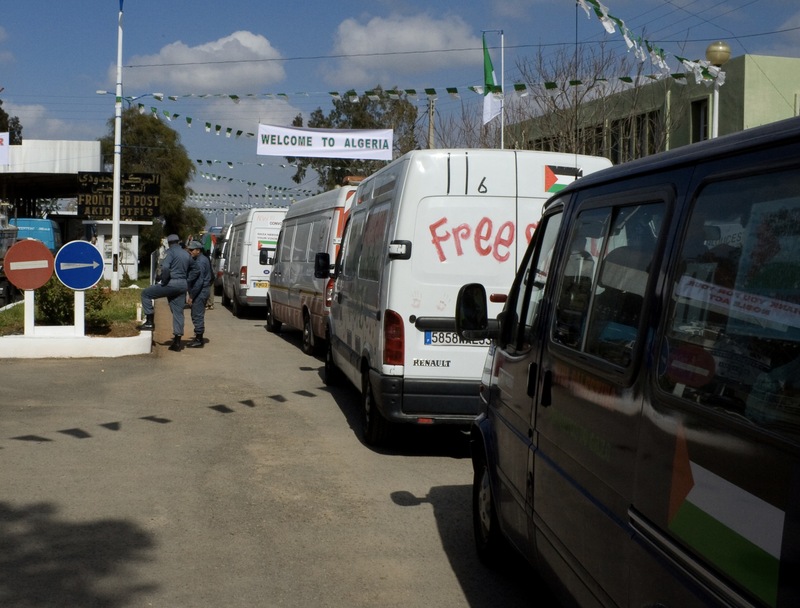 Departing in October 2010, the convoy travelled through North Africa, where we were – once again – overwhelmed by the generosity and encouragement we received from the people of Morocco, Algeria, Tunisia, Libya, and Egypt. As always with border crossings anywhere, there were bureaucratic complications. It’s often possible, however, to turn these into remarkable successes; for example, we were very grateful to be permitted to pass through the normally-closed border between Morocco and Algeria (pictured). We also stumbled into what may well have been the beginnings of the in-fighting and changes in Libya which have so violently come to the fore since. We hope that the contacts we developed may enable us to be of some help in the eventual reconstruction of that country too. Despite all the issues, and in spite of a number of our volunteers having to go home due to the protracted delays, the convoy made it through and delivered all of its aid directly to Gaza in November.